New Item! Expected to Ship 07-20-2019. Eye-catching tonewoods and active electronics. The thin, sturdy and stable jatoba/walnut neck offers superior playability when combined with the extended neck joint, making the upper frets easily accessible. 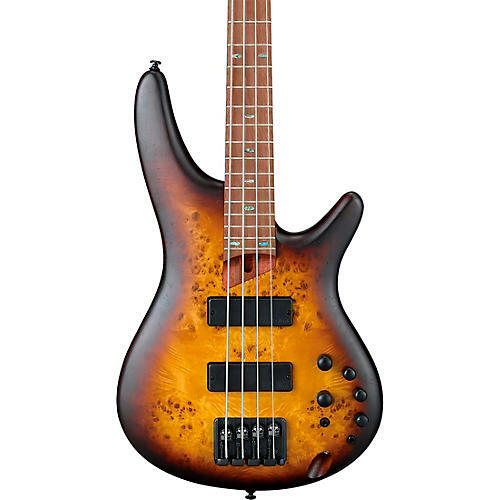 This SR500E series are equipped with Bartolini BH2 pickups in a dual-coil style configuration with a lower resonant frequency, providing a balanced, warm response with a tighter bottom end and a fuller midrange. The B500 bridge has adjustable saddles for string spacing adjustments, answering every bassist’s individual string spacing demands, no matter what playing style. The saddles can be adjusted +/-1.5mm. The neck-end adjustment allows you to tweak the neck easily without loosening the strings. Case sold separately. Step up to this pro level, yet affordable bass. Order today.